I've gotten out of the habit of cruising thrift stores looking for bargains to sell on eBay, but I was in Value Village the other day picking up a frame for the comic print I donated, and I noticed that they were having a 50%-off Sale today. So I stopped by this morning to check it out. I didn't find much of what I was looking for, but I did score two bags of Barbie kitchen items. 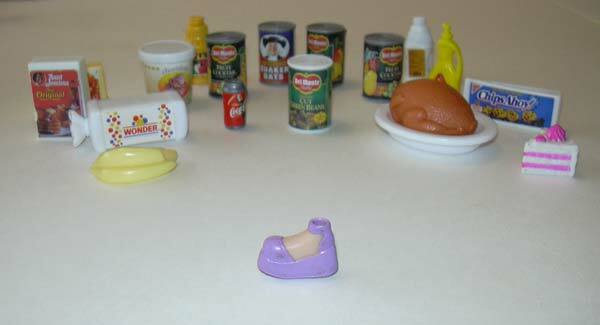 They range from realistic miniature food to oddly surreal vegetables and neon pink dishes. Later, as I was sorting them all into Useful and Non-Useful categories, I uncovered... a foot. Okay, it wasn't a real foot, but one of those tiny doll shoes that has the foot built in. Still, I found it disturbing. One just doesn't expect to find body parts among the tiny saucepans and miniature boxes of Cheerios.